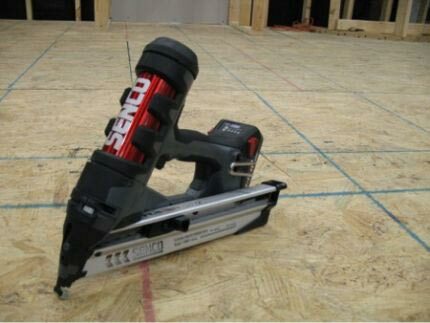 Tool Blog News Will Senco's New Cordless Nailer Replace The Compressor? Tool Hound has some breaking news from the STAFDA show about the latest creation from Senco that (like Jack BLack says) will blow your mind. Senco as many of you know, is a company that is known for their air nailers. Like many in the industry Senco also has a line of cordless nailers. The problem with these nailers is they are bulky, never have enough power, and therefor never make great compressor replacements. Some brands run completely off of battery power, which can drain the batteries quickly; while other brands use a combination of a gas engine and an electric ignition. The combo units use less battery power, but they also release gas fumes, which I am not fond of. Senco's new cordless creation uses none of the above methods, but instead uses 130 psi of compressed nitrogen as its driving method. You might be thinking that you will need to buy and replace the nitrogen cells, but according to Tool Hound the nitrogen cell is completely sealed and it is the 18v batteries job to recycle the nitrogen and reuse it. There is a loss of psi over time to the equivalent of no more then 5 psi over 100,000 shots. No word on battery life. Senco is offering both an 18 gauge and 15 gauge nailer and the price will be around $350-400. Keep your eye out for these when they are released early in 2010.